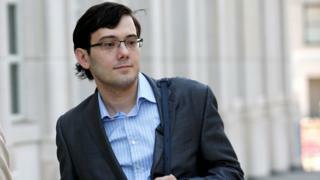 Martin Shkreli, the former drug firm executive found guilty of defrauding investors, has been sentenced to seven years in prison. The 34-year-old wept at a hearing as a federal court judge in Brooklyn, New York, handed down the prison term. Shkreli was convicted last year of sending fake account statements to investors while concealing huge losses from two hedge funds he ran. He first became notorious in 2015 for hiking the price of a lifesaving drug. His lawyers had asked the judge to impose a sentence of 12 to 18 months, while prosecutors were seeking at least 15 years. “I’ve got my begging voice on,” Shkreli’s lawyer Benjamin Brafman told the judge on Friday, while acknowledging his client could be annoying. “There are times when I want to hug him and hold him and comfort him and there are times when I want to punch him in the face,” said Mr Brafman. ‘The most hated man in America’? An uncharacteristically apologetic Shkreli said in court: “There is no conspiracy to take down Martin Shkreli. In 2015 the youthful executive made headlines after he founded Turing Pharmaceuticals, bought the anti-parasitic drug Daraprim and raised its price by 5,000% to $750 (£540) per pill. The medication is used to treat Aids patients, the pregnant and elderly. Price gouging is not illegal or even unusual in the US pharmaceutical industry. But Shkreli became a poster boy for corporate excess, and was dubbed “Pharma Bro” and the “most hated man in America”. In December 2015, he was charged with securities fraud charges and looting millions of dollars from two hedge funds he operated, MSMB Capital and MSMB Healthcare. He was convicted of those charges, as well as scheming to prop up the stock price of Retrophin, the drug company he founded in 2011. Before his sentencing, Mr Brafman told the judge that Shkreli is a “somewhat broken” person who suffered from depression and an anxiety disorder. Mr Brafman said the US government would like to just “throw away” his client. During the trial last year, Shkreli called the prosecution “junior varsity” in off-the-cuff remarks to reporters covering his trial. Prosecutors sought a gag order on him after that outburst, but the judge denied their application. After a jury found him guilty in August last year, Shkreli was allowed to remain free pending sentencing. But a month later he offered social media followers $5,000 if they could bring him hair from former US presidential candidate Hillary Clinton, who repeatedly criticised him during her campaign. A judge revoked bail and Shkreli was jailed. Prosecutors moved to seize $7.4m of his assets, including a single copy of an album by American hip hop group the Wu-Tang Clan that the disgraced executive is said to have paid $2m for at auction in 2015.